When NECA had the Assassin's Creed license, they always lagged a game behind. 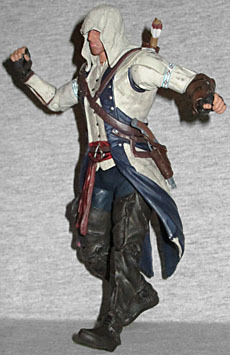 Now McFarlane Toys has the license, and they immediately played catch-up by releasing toys based on AC3 and AC4 at the same time. And hey, I've actually played this game! "Am currently playing," to be honest. I think I'm at, like, 86% completion right now? Something like that. Anyway, I've actually played this game, and I know who this guy is! 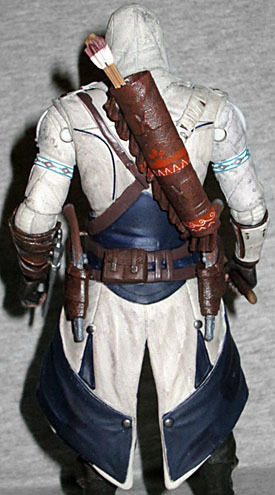 He's Connor Kenway, born Ratonhnhaké:ton, the first Native American to join the Assassin ranks. And actually, since his story starts before the Revolution and most citizens would still have considered themselves British, he might be the first Amercian Assassin, period (although by that logic, Connor would consider himself Kanien'kehá:ka [i.e. Mohawk], not American). The first thing you'll notice about McFarlane's AssCree figures is the size. Todd isn't exactly known for his ability to play well with others - remember, a jury once awarded $24.5 million to a washed-up hockey player no one had ever heard of just because they didn't like Todd personally - so it should come as no surprise that McToys didn't bother to make their figures work alongside NECA's. 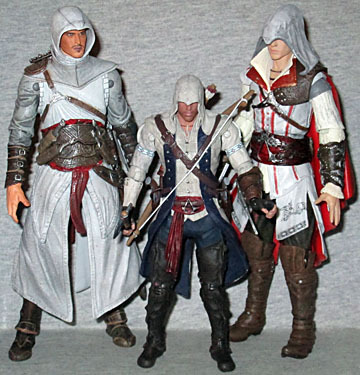 Connor stands 5¾" tall, putting him in scale with... nothing? Maybe McFarlane's Halo toys? I know they bumped the size up on those since we reviewed any. In short, he's short. The sculpt is good, at least. McToys still doesn't credit their sculptors, so we don't know who is behind this piece, but it looks reasonably like the game renders. The quality isn't as high as on NECA's offerings, but that can easily be attributed to the smaller scale - the less canvas there is to work on, the less information can be shown. Altair wore robes not because he was an Assassin, but because that was the style at the time - that's why Ezio wore an appropriately Renaissance-y jerkin, and Connor is just wearing trousers and a jacket. It's the color that matters more than anything, so as long as you've got a mainly white colorscheme, you're set! Connor accents his with blue rather than red, but the intention is there. The early version of his outfit was more blatantly in synch with the Assassins' sartorial lineage, but this one shows he's a product of two different traditions. His leather boots have a Native style, while his vest and coat are more Colonial. He has a bracer on his left arm, an Assassin symbol as a belt clasp, and beaded bands around his upper arms (though of course, not the feathers that hang from them). NECA continually pushed the boundaries of articulation for their Assassin's Creed toys, culminating in some of the best-articulated 7" figures any company has ever made. McFarlane... tried their best? When you spend years steering a ship in the wrong direction, it's hard to turn around and come back. So Conner has lots of joints, they're just not made very well. Ankles, knees, wrists, elbows, shoulders... those are all swivel/hinges, but they're these really awful-looking ratchet joints. It's like Todd thinks if he makes joints that are ugly enough, we'll all plead with him to go back to making statues, rather than thinking that he's just not skilled in modern toymaking. The head and hips have some sort of joints, but barely move, and there doesn't seem to be a waist at all. Connor does get nice accessories, though. The quiver of arrows on his back isn't removable, but he does have his bow, and it can be slung around him thanks to the elastic string. He has two pistols that fit nicely in the holsters on his hips, though getting them into his hands is a chore (same goes for the bow). 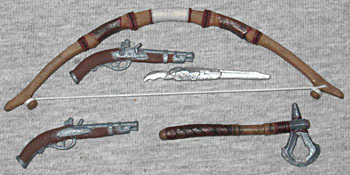 Rather than retracting, his Hidden Blade simply plugs onto his forearm, but that allows you to duplicate the way the blade in AC3 could be pivoted 90° to be used like a standard dagger. He also has my personal favorite piece of design work in all of the game: the tomahawk whose blade is the Assassin insignia. That's seriously clever. McFarlane's Assassin's Creed toys also include codes to unlock exclusive content in AC4 - wow, such idea, many innovative. Connor's code unlocks special sails, apparently? I don't know, I'm a couple years away from playing Black Flag, and by the time I do, everything will probably already be unlocked. When the first promotional glimpses of Assassin's Creed 3 were revealed at E3, one of my first thoughts was "man, I can't wait to see NECA make a toy of that!" Well, I'm going to have to wait, because unless NECA gets the AC6 license and backtracks, it ain't gonna happen. If McFarlane had been making these toys since the beginning, Connor might not seem too bad, but compared to NECA, McFarlane Toys just doesn't stack up.